More than 700 comments and you all have more to say on Barack Obama's press conference renouncing Reverend Jeremiah Wright. Memeorandum has a wrap-up from around the blogosphere. So does the New York Times. The New York Times reports on Reverand Jeremiah Wright's monomania. Now it turns out that Mr. Wright doesn’t hate America, he loves the sound of his own voice. He is not out of touch with the American culture, he is the avatar of the American celebrity principle: he grabbed his 30-second spots of infamy and turned them into 15 minutes of fame. Another blast from the past: This February, 2007 Rolling Stone article about Obama and Rev. Wright. Barack Obama, who has not been known for accessibility to the press the last few weeks (see the waffle story) called a "hastily arranged press conference" today to again disassociate himself from Rev. Wright, including his most recent remarks. The press conference lasted six minutes on the airport tarmac and he took three questions. "Some of the comments that Rev. Wright has made offend me, and I understand why they offend the American people. He does not speak for me. He does not speak for the campaign," Obama said. "Many of the statements that he's made, both that triggered this initial controversy and that he's made over the last several days, are not statements that I have heard him make previously. They don't represent my views," the senator added. He clearly was not doing Obama any favors, not only by reappearing before a ravenous media thus distracting from Obama's attempt to relate better to white working class voters in Indiana and North Carolina, but by implying Obama's condemnation of some of his sermons was not sincere. "Politicians say what they say and do what they do because of electability," Wright said, arguing that Obama had not seen the sermons played in the media that Obama has called "offensive." "He had to distance himself because he's a politician...Whether he gets elected or not, I'm still going to have to be answerable to God." Wright also defended the comments in his past sermons that have placed him in the media spotlight. But he didn't distance himself from any of the sentiments underlying the clips shown on television. Indeed, the former pastor embraced the most controversial items he has said. Rev. Jeremiah Wright attacks the coporate media today in a speech to the NAACP. The audience of 10,000 gave him a standing ovation. Update: Comments closing, a new thread on the speech is here. Rev. Jeremiah Wright, former pastor of the Trinity Church, gives his first interview since becoming a household name to Bill Moyers on PBS tonight. You can watch a clip and read some details of what he says here. I was struck by his comments that Barack Obama's race speech was "the politican talking." Wright said he was hurt by what he considers unfair use of the sound bites, but understood why Obama had harsh words about his statements during a speech on race that the candidate delivered in Philadelphia. Wright said he is obligated to speak as a pastor, but Obama addresses audiences as a politician. "I don't talk to him about politics," Wright said. "And so he had a political event, he goes out as a politician and says what he has to say as a politician. I'm not sure whatpoint the Obama campaign thought they were making by providing the New York Times with a picture of Rev. Jeremiah Wright in a room full of people at a 1998 Prayer Breakfast at the White House shaking hands with Bill Clinton. 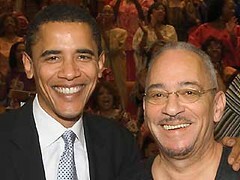 "Less than 48 hours after calling for a high-minded conversation on race, according to the New York Times the Obama campaign is peddling photos of an occasion when President Clinton shook hands with Reverend Wright. To be clear, President Clinton took tens of thousands of photos during his eight years as president." On Larry King Live: (live-blogging)What Wright said is unacceptable. His statements were hurtful and reckless. He wasn't aware of them, he wasn't in the church when he said them. His church is a typical traditional AA Church. It's a bedrock of the South Side of Chicago with people from all walks of life. Had I known that these comments were made, I would have confronted him directly, and I might have left. His own career is about bringing people together. His own background is one of diversity. He's rooted in the AA community, there are flaws in the AA community, just as there are with all communities.